Brinjals or egg plants as they are known in some countries, have a very distinguished taste and colour. Usually these are roasted on low heat or baked as they they soften up nicely and quickly. Boil the potatoes and mash them. Cut onions in small square cubes and add to the potatoes.Add coriander and a bit of salt to it. Mix well with hands. Cut the brinjal slices, longitudinally, and fry them. Take a dish and place the fried brinjal slices in it. Now drip some sweet and sour sauce on it. Take spoonful of potato mixture and cover a brinjal with it. Repeat the process for all brinjals. Again place a brinjal slice and pour some sweet and sour sauce on it followed by a layer of potato mixture. 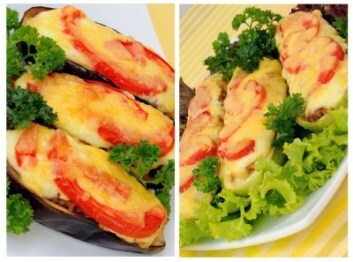 Make a third layer of brinjal slices and sweet and sour sauce and then put some grated cheese on top. Glaze a baking tray and place these yummy veggies inside. Bake for fifteen minutes and serve.